RALEIGH, NC -- North Carolina State remains tough to beat at home. Wake Forest isn't going to beat anyone if it keeps going cold late in games. Markell Johnson had 13 points and Torin Dorn added 11, including a key jumper that put the Wolfpack up by four points with 57.5 seconds to play. N.C. State (13-6, 3-3 Atlantic Coast Conference) shot nearly 42 percent - but was just 7 of 26 from 3-point range - yet closed with an 11-0 run to improve to 12-1 at PNC Arena. 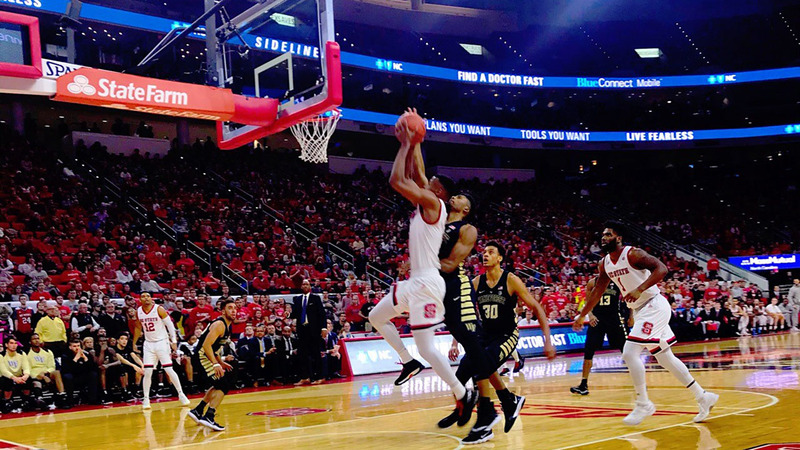 "Give our guys a lot of credit - we won the game on the defensive end on a night we weren't shooting particularly well," N.C. State coach Kevin Keatts said. "Our guys defended at the end." Bryant Crawford scored 18 points and Doral Moore finished with 15 points and 10 rebounds for the Demon Deacons (8-10, 1-5). They have lost four straight and six of seven, and led 63-61 on Moore's dunk with 4 minutes left but didn't score the rest of the way, missing their last seven shots. This ending was painfully familiar for Wake Forest, which allowed scoreless, game-ending runs to Tennessee (13-0) and North Carolina (8-0) over the past month. "I thought we had opportunities to score. Just didn't make shots," Wake Forest coach Danny Manning said. "We got the ball to the rim a couple of times but didn't finish when we needed to. ... We just have to continue to get paint touches and not settle. I thought we settled a little bit for long jump shots." Johnson put N.C. State ahead 65-63 with a jumper with just under two minutes left, and after Dorn's bucket, Johnson followed with two free throws and Lavar Batts Jr. added another to make it a three-possession game in the final 30 seconds. Braxton Beverly finished with 10 points and nine assists for N.C. State. Wake Forest: Make it another long trip back from the Triangle for the Demon Deacons, who are a combined 2-30 in their last 32 visits to either N.C. State, Duke or North Carolina since the infamous Chris Paul-Julius Hodge groin-tapping episode in 2005. Wake Forest had lost 11 straight in Raleigh before last year's win here, but the latest late-game fade is sure to be the lasting memory of this one. N.C. State: The Wolfpack sure seem to have found their legs since their wobbly start to ACC play. They've won three of five with no shame in their lone loss in that stretch, which came at second-ranked Virginia. It helps that N.C. State has a stabilizing force in Yurtseven, a 7-footer who has shown deft 3-point touch and scored 13 point after halftime. After Dorn tied it at 63 with a free throw, Wake Forest's experienced backcourt of Crawford (a junior) and senior Mitchell Wilbekin was called for a 10-second violation after they couldn't get the ball past midcourt in time. Johnson's go-ahead jumper came on the Wolfpack's next possession. "That, to me, is inexcusable with the veteran group we had in," Manning said. Johnson played his second game since serving a seven-game suspension for violating the school's student-athlete code of conduct, showing marked progress from his 0-for-2 shooting performance in the loss at Virginia. He insists he's in game shape - "I'm back," he said - but Keatts said the guard still shows signs of fatigue. "Any time you go through some adversity, it kind of helps you grow up in a way," Keatts said. "He's worked hard." "That's bad assistant coaching" - Keatts, playfully tweaking his staff after being informed that Beverly was an assist from a double-double. Wake Forest: Plays host to No. 2 Virginia on Sunday night. N.C. State: Plays host to No. 25 Miami on Sunday.